First and foremost, we owe Game On! a big apology. We’d spent two years CONVINCED we’d reviewed their nachos. To us, the Fenway bars are a bit of a blur, and with woeful humility we admit to confusing the bounty of Game On! nachos with the plebeian bore-fest at Cask & Flagon. Oh, Game On! we throw ourselves on your mercy and proudly announce your candidacy for the best nachos in Fenway (not that there’s much viable competition in that category). Appearance: (8) As she delicately placed these upon the table, our waitress warned, “I have never seen them put so much chili on something.” We can agree! 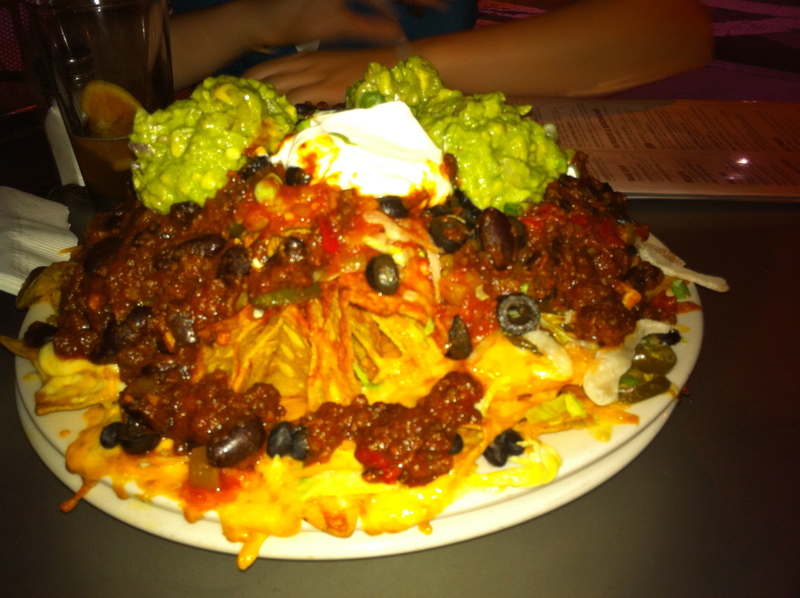 Along with the ooey-gooey cheese and perked-up ears of guacamole, these appeared to be quite an exceptional nacho. Distribution of toppings: (9) The tidal wave of chili roaring across the quiet countryside of these nachos burst through the levees of cheese and chips to soak through to the very foundations. We were just about ready to call for FEMA to step in and declare it a state of nacho emergency. While we’re not sure if such a deluge is common practice at Game On! (they may have received reports that we’d be dropping by), the proportions were about right and there was plenty of topping to go around. Quality of toppings: (8.25) Once again we find a sweeter chili, with a distinct note of teriyaki. Though it’s not our favorite, we enjoyed it and the kidney beans. For the most part, the ingredients were fairly standard–nothing stood out as especially delicious and the guac could have used a bit more seasoning. Here’s a lesson. Price: (7.25) We were extremely skeptical of these nachos: an extra $3 for guacamole making these top out at $15? Unheard of! But when it came down to it, there were far more worth their high price than we could have ever imagined. Four of us gave it the ol’ college try and still failed to finish them. Overall: 32.5/40. FINALLY, great nachos in Fenway! Game On!, you were worth the wait. Game On!, tonight you surprised us, and after 100+ reviews, that’s hard to do. What with our multiple traumatic experiences with Beer Works nachos, the blandness of Fenway Cantina and Cask & Flagon, and the predictable nightmare of Fenway Park, we thought the Fenway area was a wasteland. Nevertheless, you delivered the goods and while we’d love to see the price come down from its low-earth orbit, you finally gave us a place to recommend to our multitudinous following of drunk Red Sox fans. ← Brighton Beer Garden: Right On, Beer Garden!